Part two of my recent trip down through some of the lakes around the Kiosk access point (and also through the swarms of bugs living around the Kiosk access point at the time) is now up over at All of Algonquin. 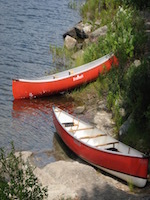 Hope your Canada Day has some paddling in store for you. Wow, those bugs really did chomp down on you hard. That shot of your leg was awful. My go to move when dealing with bugs is to cover up with clothing. Sometimes that leads to a lot of sweat, but if it saves some bites, it's worth it to me. Also, I can recall the sound from two weeks ago, of what sounded like a million mosquitoes just a few inches away from my head, but thankfully on the other side of a screen, as I awoke. It's quite the symphony. Anyway, thanks for sharing your tale. I'm counting down the hours until I head to Killarney this afternoon. The canoe is strapped down, and ready to go. We don't have any portaging planned, but are looking forward to getting a few paddle strokes in. I noticed your bow paddler, Vince I believe, was wearing a Bug Shirt. Did he have the same reaction/opinion on the swarms as you? Dressing properly for any season, and yes bug season is a season in N. Ontario, is essential for the max enjoyment of any outdoor activity. Life is short, paddle lots and paddle slow. Thanks for reading and commenting folks. I've never been to Killarney but I really want to at some point. It's just a bit of a drive from Ottawa. bugmeist, my buddy didn't get bitten as badly as I did for sure, but they actually bothered him more than they did me I think. I fudged things a bit in my report because I knew he'd be reading it, but I would have been ok with staying out another night despite the bugs. He was definitely ready to get away from them though. I just cam back from a trip up there myself and I must say I think the bugs were the worst I have seen in over 10 years. The Deer and horse fly's were killer and of course at 45+ with the humidex, the bug jacket and pants was like wrapping yourself in foil like a baked potato, just way too hot. The bug gear could only come out when the sun was going down. the rest was up to the spray. I did however carry a bug net to hang from a tree so that helped allot for the evening skeeters. Lets just say I swallowed allot of extra protein while paddling that trip! Most folks don't realize that at least 1 Bug Shirt (the Original Bug Shirt) is designed so that in hot weather it can be worn directly over the skin. It is also helpful to pour some water on it as the evaporation is cooling. Many people do this with the hats but not many realize you can do the same with an (Original) bug Shirt. I hope this doesn't sound like an ad as my intention was to point out a "hack" on using a particular brand of protective clothing. I leave it up to the moderators.